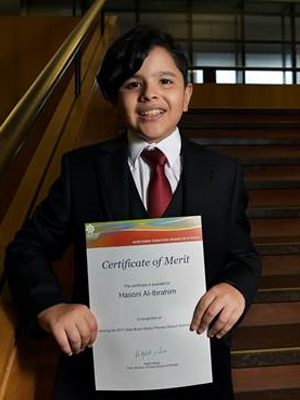 Stuart Park Primary School graduate Hasoni Al-Ibrahim received the Sally Bruyn Senior Primary School Science Award for demonstrating achievements in science learning and understanding in the classroom. The former Year 6 scholar said he was very pleased that his work had been acknowledged with a prize. Hasoni has a strong desire to learn, and enthusiastically reads and investigates in his own time. “I have two favourite subjects – science and maths. There are a lot of things to look up and examine, and I do a lot of research on the internet, and in books,” he said. Hasoni would like a career in the medical industry, but for now he is focussing on being a Year 7 student at Darwin Middle School. “The work is a lot more challenging at Darwin Middle School, and I’m moving around more often from class to class,” he said. Hasoni has also found more opportunities at his new school, and is on the lookout for competitions he can enter, such as the brain bending Tournament of Minds. “I’ve only been here three weeks, and I’ve already found an event,” he said.